The first part in Awkward Silence’s new 3” series - now that vinyl manufacturing costs have become prohibitive enough for them to abandon their beloved 7” format). 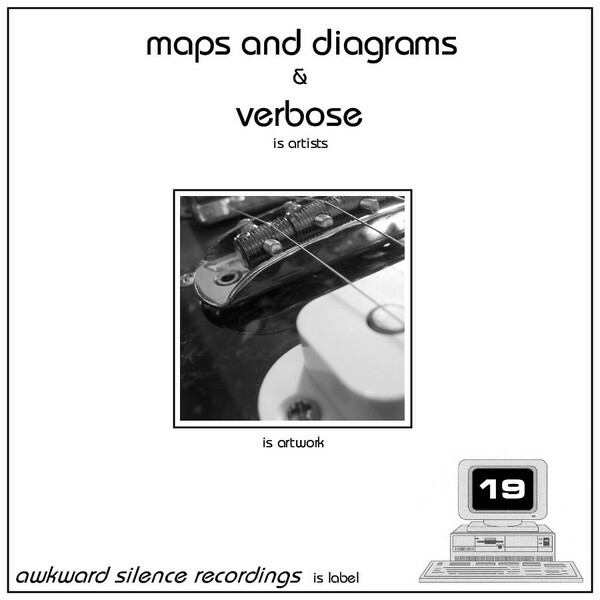 Housed in a dinky little case, the 3" CD features exclusive new material from Tim Martin (aka Maps and Diagrams) and Allan Richmond (aka Verbose). Martin opens with a trilogy of classic Maps and Diagrams compositions, starting on the creased electronica of 'Tora-Fugu'. Very much in the IDM mould, 'Tora-Fugu' opens with broad but considered atmospherics before tickling a fidgeting bag of beats into life, leading to a sound comparable to that of Magnetaphone. Similarly, both 'Cocoon Life' and 'Sajaya Station' make the most of the summer weather, coating the glistening and arch soundscapes with paper cut beats that provide a sharp (but welcome) contrast. On the metaphorical flip, Verbose gets stuck in to some acoustic tinged electronica, egging the stammering beats on with warm and cinematic instrumentation that places him in the same environs as 65daysofstatic (albeit minus the distortion ripped squall).